We gather to worship God, the Lord and Giver of Life. God gives us the waters of new life. To give us hope when our lives run dry, to give us strength when our world seems barren. There has been a tremendous amount of reportage on what has been dubbed "Day Zero" for the South African city of Cape Town. The ominous term refers to the day when the water runs out for the city. Cape Town is a major centre on the African continent, the second largest city in the country with a population pushing four million. And it is running out of water. The reservoirs have reached dangerously low levels with no prospect of being replenished by rains. There is now severe rationing, enforced by city officials. People are bathing infrequently, flushing once a day, using grey water for plants. Still, the prospect of running out of water looms over the city. The economy is affected as well. Cape Town is a popular tourism destination but fewer people want to visit a city where they are encouraged not to shower or flush the toilet. What is booming is Kijiji ads for those who will do water runs to other areas, for a fee. The global fascination with Cape Town's plight no doubt comes from the prospect that if it can happen in this larger urban centre it can happen elsewhere. The truth is that it is already occurring and it is almost certainly a combination of climate change and unrestricted usage of a precious resource. Santa Fe, the capital of New Mexico, requires water conservation measures as the aquifer which supplies the city is depleted. Communities in California have run out of water in the midst of drought, or have come close, bringing it in by the truckload for residents. We take it for granted that water will be available for our needs, whether in towns and cities or in rural areas, for agriculture. Yet the "what if" questions are being asked in the Canadian West as snow pack in the mountains lessens and summers are drier. Forest fires were a major problem in BC last summer. It is encouraging that conservation is making a difference in Cape Town and Day Zero keeps getting pushed further into the year. Some residents are angry about this, convinced that officials have created the panic, but the crisis is real. Faith groups are participating in the response, both in terms of worship and in encouraging conservation measures. 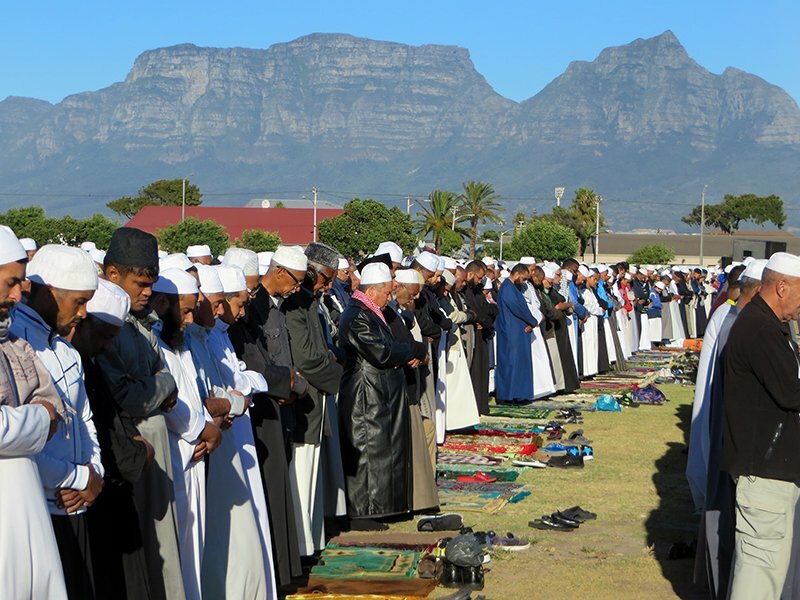 A thousand Muslims gathered for outdoor prayer for rain and Christians have as well. Congregations are grappling with being told they can't use their wells which will affect meal ministries and other programs. 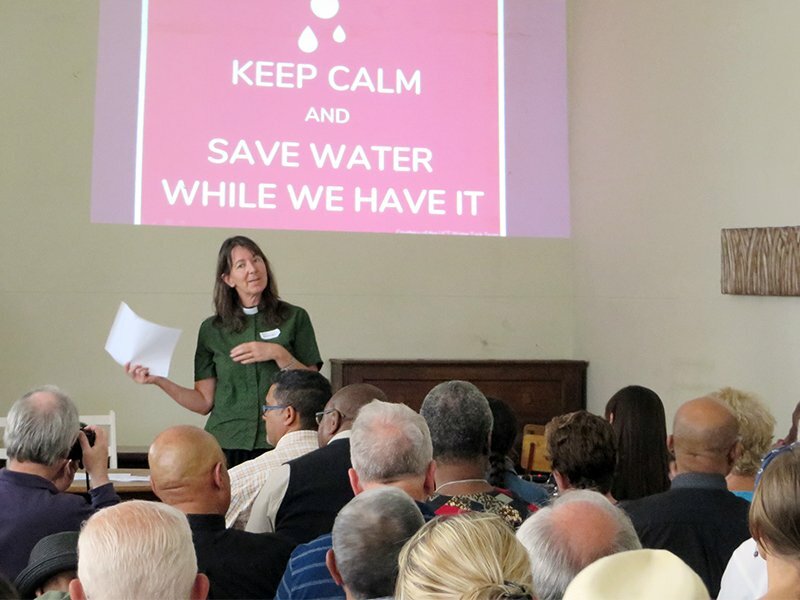 An Anglican conference was held to address what is unfolding with an encouragement to live with purposeful hope rather than a "day zero" mentality. Wherever we are, whatever we assume about the availability of water, we can be mindful that water is sacred in scripture, that Jesus is Living Water, and that we must regard it with respect as a gift from the Creator. We can join in praying for the people of Cape Town and for a change of heart and mind which will result in conservation and simple living for all of us. Could Day Zero happen in our country of abundant fresh water? Are you a water conserver? I take nothing for granted, even in this country full of lakes. I do consider myself a water conserver, and I can't tell you how much it drives me crazy to see those automatic sprinklers on during or shortly after a rainfall. Craziness!